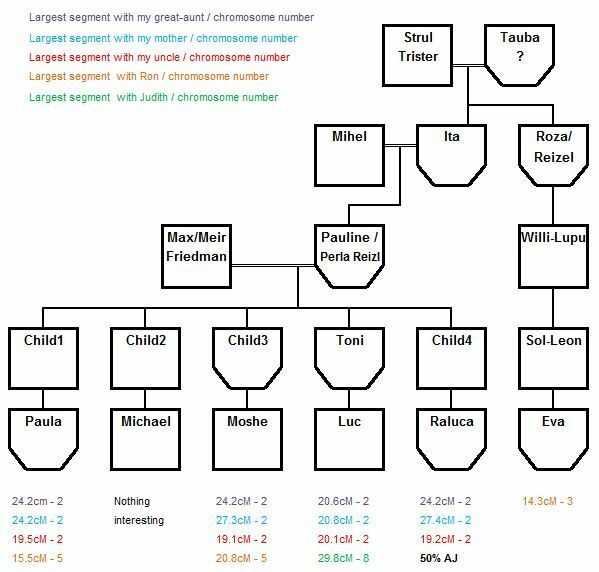 So this looks quite promising in some kind of connection between my maternal grandmother's family and Luc's mother's family. But here's the issue: I have my maternal grandmother's family well-documented in what is now Subcarpathian Ukraine back to the late 1700s. Luc has his mother's family well-documented in what is now the Botosani, Romania area back to around 1850 for sure. He explains that "unfortunately there are no civil vital records before 1865. So I know for certain the births of a lot of relatives but the death certificates for older people are not reliable as far as the place of origin. There are some scattered community records for 1850s and some census-type data for foreign subjects for 1825, 1834 and 1844." So it seems like we can't be related any more closely than 6th cousins--but that one segment has been consistently passed down for many generations! Kolodne & Botosani are 145 miles apart, separated by a mountain range. Google Maps says it is a 7.5-hour drive. Using GedMatch's Matching Segment Search doesn't show this to be a very common segment. Besides several of my kits and several of Luc's, looking at people sharing segments of 18cM and more, there are kits administered by two other individuals--each with two kits sharing this segment. For the first, the relatives with this segment had ancestors from Soroca (on the modern-day Moldova/Ukraine border) and Illintsi (near Vinnitsa, Ukraine). For the second, I match her and her father--and his parents are from Berdichev, Ukraine. As another data point, Luc and I share an mtDNA haplogroup--however K1a1b1a is a very common Jewish haplogroup. So it may mean something, or it may mean nothing at all. So what's with this segment--and why does my Subcarpathian family share it with these families? I know via DNA matches (stronger ones than with Luc & his family) that my grandmother's parents are who I think they are--and they were both born in Subcarpathian Ukraine. Could there be two or more much smaller adjacent segments? Could this be a sticky segment which was simply passed down intact for many generations through descendants of four siblings/cousins who ended up geographically separated? Something else? I'd appreciate any ideas. So now the question is how old this segment actually is! Note: I'm on Twitter. Follow me (@larasgenealogy). The fact that Matching Segments didn't give you a significant number of other people makes it appear fairly focused on your families rather than some generic sticky segment. These are all segments less than 30 cM, so they are not extreme. Twenties can stay together. Remember, my fourth cousin Anna has a segment of 60+ cM with some of us and 3-40 with others. Yes, but he believes they were in Botosani even longer; records just don't exist to show that. I enjoy reading your posts. My posting is more of a testimony then trying to give advice. I manage kits for members in my family as well. We recently found a connection to a woman that matches my paternal great-aunt. The woman contacted me in this circumstance and I noticed that we shared a similar surname from Bessarabia. She matched my great-aunt at 2-larger segments (one being 42 cm and the other 18 CM), including a few smaller segments under 10 CM, which I usually consider to be noise. Well, it turns out that this woman and my great-aunt are 4th cousins! The information about our common ancestor (dating back to the late 1700's) was in the Bessarabia section of the Romania database all along, but the spelling that I had was different. I had it as Knop and the database showed it as Konop. So, it helped me go back a few more generations, but if my match didn't have this information we wouldn't be able to tangibly link the information which very likely connects us. So, I'm feeling very thankful now. I have to go check Luc's DNA on GEDmatch. It was about four years ago that he contacted me through Ancestry hoping that his Goldschlagers and mine were related. Back then I hadn't done DNA, and he only had a Y DNA test. I have to go check! Great post, as always, Lara. This is very timely as I am working on a Jewish unknown parentage case. Of course the maternal haplogroup is K1a1b1a. I have been working through similar clusters of segments between 18-25. I look forward to hearing more about your case. As ever, a fascinating post. There is always a risk that as your pool of data gets larger, things that look like oddities but aren't are more likely to pop up and grab attention. I suspect this is such a case. As I'm sure you know, the shorter a fragment is, the less likely it is to be further fragmented by recombination. For a 20 cM stretch, the chance per generation that it will not be fragmented can be approximated by (.99)^20, or about 80%. So if it is to be inherited at all (50%), most likely it will be inherited intact. Now, you found Luc who shares this fragment with you. The chance that 3 of his first cousins would inherit the same fragment and 1 wouldn't is one in four, nothing remarkable there (I love that you're forcing me to recall high school probability lessons!). The fact that your relatives and Luc share this fragment despite not being related for umpteen generations may be provocative...but there are hundreds of 20 cM segments in the genome (thousands if you include overlaps) and the fact that you have something in common out of all that is not so remarkable. As you noted, you have previously been successful in tracing connections hinted at by large persistent fragments, and of course that is to be expected. But coming up blank now and then is also to be expected. Or at least that's my take. An anecdote from my own family - my cousin and I share a 42 cM fragment. We are multiply related - both 4th cousins and 5th cousins. Sometimes those big fragments do persist. Very interesting! Any chance that you know of a male Zopcoff related to your Halke (are you sure it isn't Malke, by the way?)? A y dna test would be most informative. There is one male in my generation J-P 58 and one in the next generation J-M67, but this is not a Zopcoff male line. We just have this one Z female. 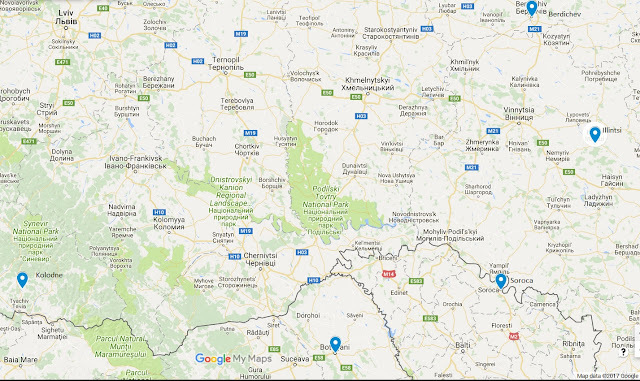 By the way, I see I made an error above: should say Kiev, not Kishinev. Kiev is more promising than Kishinev. Unfortunately no matches between any of my Zubkis descendants and your kits. So it's very possible, but we just don't have the documentation or DNA to prove or disprove.